Our Risk Slide tool allows you to visualize how market events or changes in volatility may impact positions in your portfolio and view potential P&L numerically and graphically based on potential market scenarios such as different movements in the S&P 500®. With this release you can now see those profit and loss numbers through a couple different lenses. The two new views we have added to the Risk Slide are "Account Value" and "Percent." The Risk Slide is found under your "Account" tab. This is where you will find a table displaying profit and loss numbers at different points indicated by the column headers. The "View" can be changed at the top left from the default P&L to Account Value or Percent. Account Value displays the value for your entire account as the underlying symbol in your portfolio moves up and down the slide. Percent is the percentage change for that same account value. Lists are important for keeping track of your trading. Whether it is an order book or a Watch List of symbols, alerts, or position data, your trading day is likely full of navigating lists. With this in mind, we decided to give your eyes a little relief with the addition of row highlights. Now you will see different shading for alternating rows for all of your lists. Row Highlighting (or Zebra Striping for the hipsters) will change the rows of your lists to alternating colors. This is a global setting, so once enabled it will affect your entire platform. 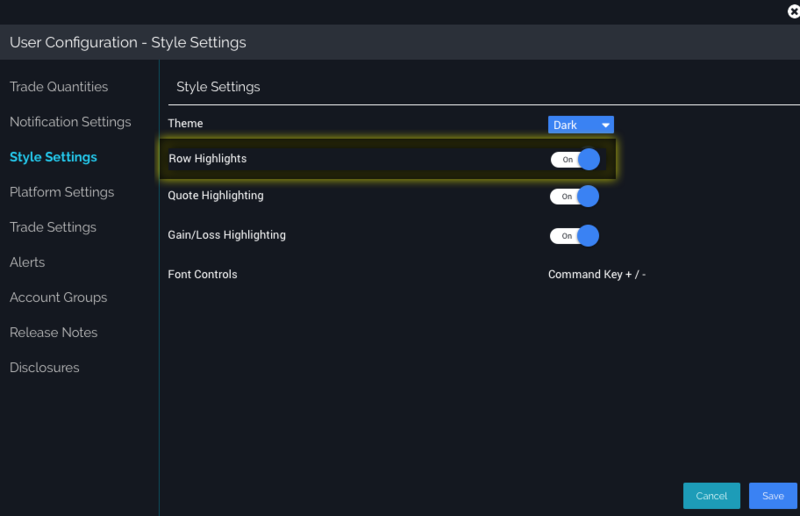 The Row Highlighting setting can be found in your User Configuration under "Style." We are also not done expanding our "News" tools yet. As we are making our News page more helpful and more idea-driven, we are also trying to make it easier to read. We have drastically reduced the size of each row on the page, so now you can see twice as many news headlines at a glance. This feature’s beauty lies in its simplicity. 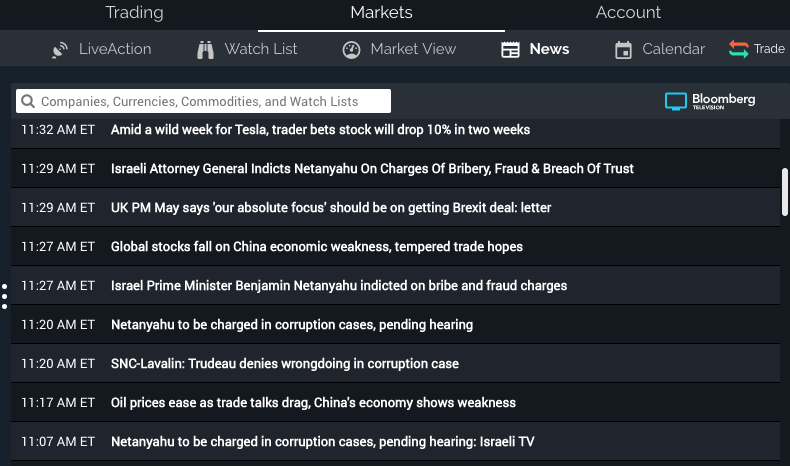 Just navigate to the "Markets" tab, and choose the "News" page. All of the news headlines are now one row in height. To see more details, hover over the headline, and it will expand. Click on the headline to pop out the full article.